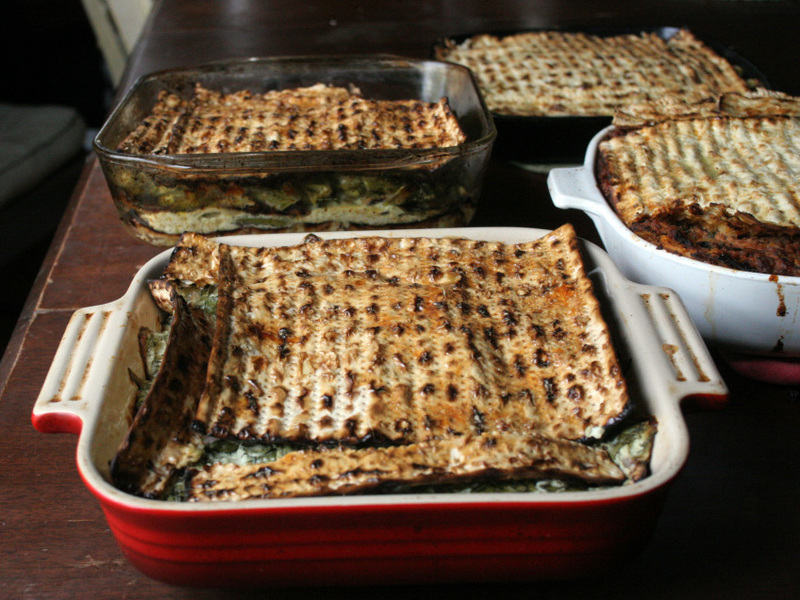 Kitchen Window: A Passover Recipe As Easy As Matzo Pie Minas, or layered matzo pies, are found in Jewish cuisine from Egypt to Turkey to the Isle of Rhodes. 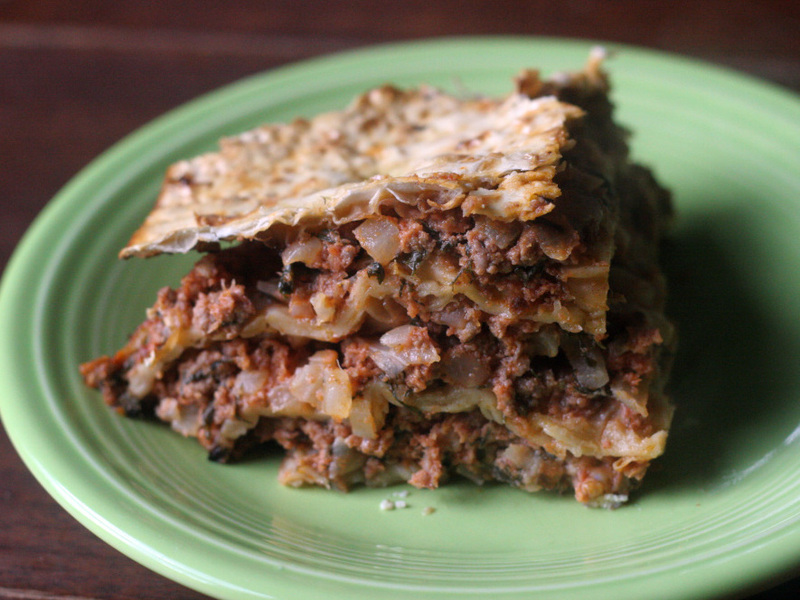 Sheets of stiff matzo crackers are softened with water until pliable, then layered with savory fillings and baked, yielding something akin to a Passover-friendly, Ottoman-inflected take on lasagna. Get recipes for a Basic Mina Template; Roman-Inspired Potato, Pea And Artichoke Filling With Gremolata; Leek And Asparagus Filling With Mint And Lemon; Spinach And Feta Filling With Fresh Dill; and Mina De Carne Filling. Toward the opening of the Passover Seder, participants point to the matzo on the table, and announce: "This is the bread of affliction that our ancestors ate in the land of Egypt. Let all who are hungry come and eat. Let all who are needy come and celebrate Passover." It's a lovely sentiment, remembering the struggles of previous generations of Jews, and opening your home to all those who suffer to this day. But bread of affliction? No more. Layered matzo pies, or minas, await slicing. The top layer of matzo is glazed with a beaten egg, to give the finished dish a burnished shine. While matzo — a cracker-like unleavened bread — harkens back to a time of slavery and fleeing without time for loaves to fully rise, it has come a long way from hardship fare. Matzo is now coated with crunchy caramel, or dipped in chocolate, or dredged in nuts (or, rapturously, sometimes all three at once). Ground into meal, it's mixed with oil or schmaltz (chicken fat) and shaped into feather-light matzo balls (or, depending on your tastes and the kitchen skills of your family matriarch, somewhat denser, more-toothsome-yet-equally-beloved "sinkers"). And, if you're lucky enough to come from a Sephardic background, it's formed into minas. Minas, also known as meginas or mehinas, are layered matzo pies, found in Jewish cuisine from Egypt to Turkey to the Isle of Rhodes. 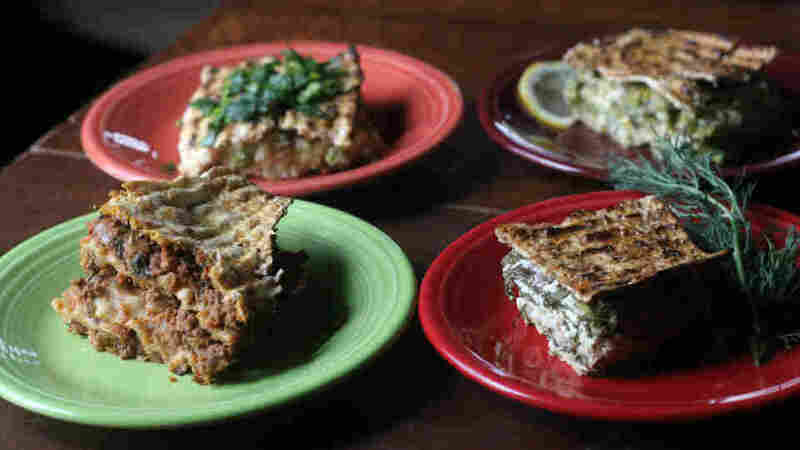 Sheets of stiff matzo crackers are softened with water until pliable, then layered with savory fillings and baked, yielding something akin to a Passover-friendly, Ottoman-inflected take on lasagna. Sheets of stiff matzo crackers are softened with water until pliable, then layered with savory fillings and baked, yielding something akin to a Passover-friendly, Ottoman-inflected take on lasagna. Mina fillings run the gamut, from herb-flecked lamb pies to meltingly soft stewed eggplant, many of them similar to the savory turnovers (bourekas, samboussek, etc.) found throughout the Sephardic world. Minas can be cut small and served as appetizers (part of the ever-delicious mezze tradition), offered as part of a spread of dishes or served as main dish showstoppers. Vegetable minas are especially beloved as the often-hard-to-find traditional vegetarian Passover entree. A search for mina recipes, however, can yield something of a mixed bag. Many Sephardic recipes become Americanized over time, with lamb giving way to beef, frozen spinach replacing fresh, and warm spices and fresh herbs falling by the wayside. To find truly exciting minas, I checked with the experts. Jennifer Abadi comes from a family of Syrian Jews with a rich culinary history, detailed in her cookbook A Fistful of Lentils, and has been researching Sephardic Passover recipes for several years. She found mina variations from Italian, Greek and Egyptian traditions, bright with fresh herbs and varying slightly across the regions. Deena Prichep is a Portland, Ore.-based freelance print and radio journalist. Her stories on topics ranging from urban agriculture to gefilte fish have appeared on The Splendid Table, Morning Edition, All Things Considered, Marketplace, Voice of America, The Environment Report, Salon.com, The Northwest News Network and Culinate.com, and in The Oregonian and Portland Monthly. She chronicles her cooking experiments at Mostly Foodstuffs. She kindly shared a recipe for a Turkish mina de carne, featuring a rich filling of oniony lamb and beef in tomato sauce, perked up with handfuls of fresh parsley and dill. 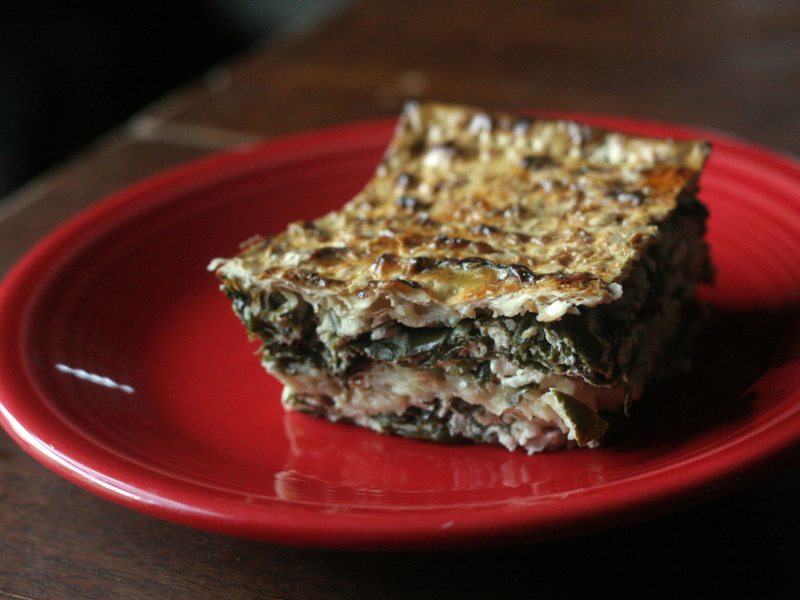 I adapted my own favorite spinach-feta pie filling as well, adding extra moisture in the form of not-traditional-but-oh-so-creamy cottage cheese, to account for the matzo's tendency to sop up liquid. And because Passover also celebrates the coming spring, I pulled together two fillings celebrating the new crops. A Roman-inspired potato-artichoke filling is simmered with saffron and studded with peas, then topped with punchy parsley-lemon-garlic gremolata. 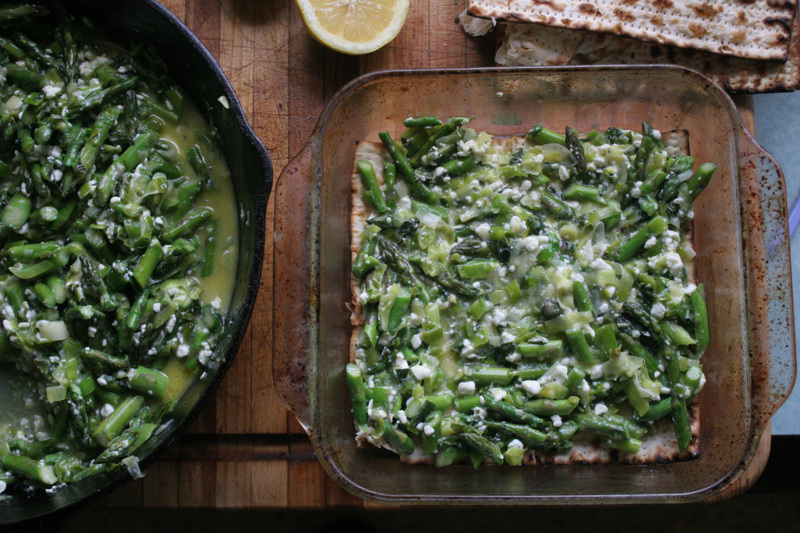 Leeks, which are often fried up as fritters at Sephardic Seders (the beloved keftes de prasa), are sauteed with spring asparagus, then given a sunny lift with fresh mint and lemon zest. Whatever the filling, the basic template is the same: Moisten sheets of matzo with water and set them aside for a few minutes to absorb the liquid and soften. The pliable sheets are then layered with your filling of choice — most of these recipes use three layers of matzo, although Abadi's large and saucy mina is best made with four. The top layer of matzo is glazed with a beaten egg, to give the finished dish a burnished shine. After a good bake, the mina is allowed to set for a few minutes, and then devoured. Matzo is certainly no longer a bread of affliction. 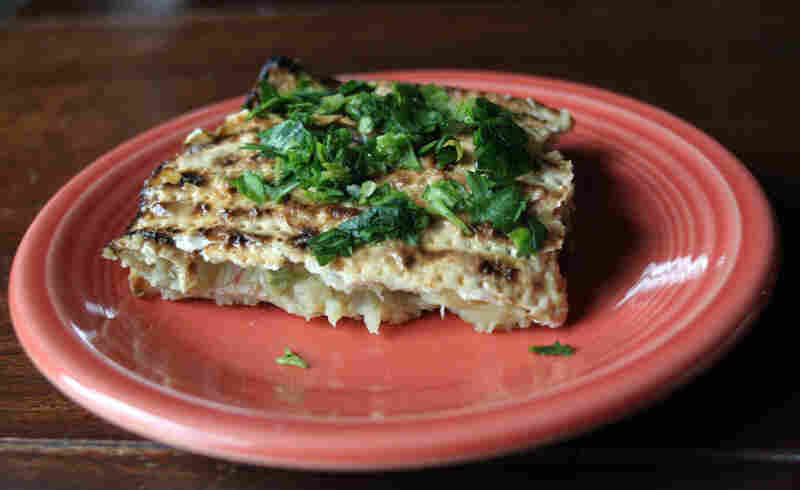 Any type of filling can be used with these basic instructions for making a layered matzo pie. 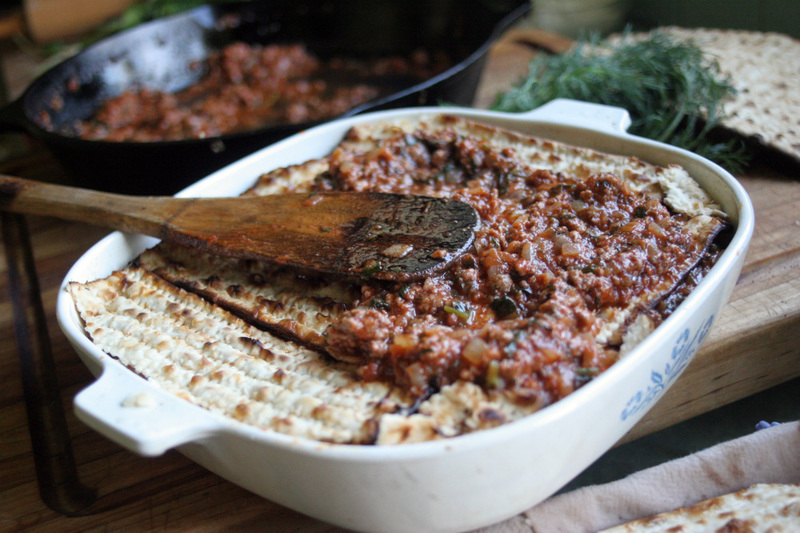 Minas, or matzo pies, consist of alternating layers of moistened sheets of matzo and fillings, such as this Turkish-style mina with ground lamb and beef (see Mina De Carne recipe below). Preheat the oven to 350 degrees, and oil an 8- or 9-inch square casserole dish. You can use equivalent casserole dishes of other shapes if desired — which might involve a little more breaking and reassembling of matzo to cover the dish. Soften the matzo sheets, either by dipping them in a dish of water or running them under the faucet, until they are just starting to soften (you don't want to oversoak, or they'll become mushy). Set aside in a clean dish towel for about 5 minutes, then check to see that they have become somewhat bendable. If not, moisten them further and set them aside for another few minutes to absorb. When the matzo is ready, cover the entire bottom of the baking dish with a layer of matzo (you will have to break some matzo in pieces to fill in the gaps). Gently spread half of the filling over the matzo. Top with another layer of matzo, then the remaining filling and then a final layer of matzo. Pour the beaten egg over the top, and spread to evenly glaze the top layer of matzo. Bake until the matzo is golden and the filling is hot and set, about 45 minutes. Allow to cool and set for 15 minutes, then serve. Italian Jewish cuisine does a wonderful job of celebrating the foods of spring, often lightly stewing them up with just a bit of seasoning such as saffron. In this mina, artichoke bottoms (fresh or frozen) are simmered with an equal amount of potatoes and studded with peas. Gremolata, a pungent mixture of lemon zest, garlic and fresh parsley, is not common to Sephardic cuisine (you're more likely to see it accompanying the Milanese osso buco), but it does a lovely job of bringing a bright note to the oven-cooked mina. *Frozen artichoke bottoms are available in Middle Eastern markets. Jarred artichoke bottoms are available at some supermarkets. Make sure they are plain, not marinated. Heat the olive oil in a pot over medium heat. Add the garlic, saute for 1 minute and add the sliced artichoke bottoms. Saute until the garlic colors to a light brown. Add the potatoes, broth and saffron. Bring to a boil, then reduce the heat until it is just high enough to maintain a simmer. Cover and simmer until the potatoes are falling-apart tender, 20 to 30 minutes. When the potatoes are done, mash the entire mixture with a potato masher (or fork, if you don't have one) until everything is reduced to a rough mash, with no pieces larger than bite-size. The mixture should be much looser than standard mashed potatoes, somewhere just shy of soupy. You can add more broth (or simmer some off) as needed. Season to taste with salt and white pepper — depending on the saltiness of the broth, salt may not be needed. Stir in the peas. Proceed with the Basic Mina Template recipe. When the mina is out of the oven, mix together all of the gremolata ingredients, and bring to the table for diners to sprinkle over their mina as desired. A hot sauce such as harissa also is nice. Sephardic Jews make leek fritters (keftes de prasa) for holidays from Rosh Hashanah to Passover to Hanukkah. Here the beloved leeks are combined with spears of asparagus, and the whole mixture is perked up with lemon zest and fresh mint. If you'd like to serve this for a dairy-free kosher meat meal, simply swap out the cottage cheese for an equal amount of moist mashed potatoes. The prepared leek-and-asparagus filling is spread between layers of water-dampened matzo. Heat the olive oil in a large skillet over a medium flame. Add the leeks, sprinkle with the salt and saute until they totally soften but do not color, about 10 minutes. Add the asparagus, cook for an additional minute until they just begin to turn bright green, then turn off the heat (they'll cook further in the oven). Add the mint and lemon zest, black pepper to taste and additional salt if needed. Let cool for a couple of minutes, then add the cottage cheese and eggs, stirring to combine, and proceed with the Basic Mina Template recipe. In most spanakopita recipes, the goal is to drain off excess liquid before it makes crisp phyllo dough soggy. In minas, the matzo does a fine job of absorbing excess liquid, and you can use fresh spinach without worry. This recipe is unabashedly cheesy, tangy with feta and snappy with fresh dill. Mix together the cottage and feta cheeses, dill and onion. Season to taste with salt and pepper — it should be somewhat strongly seasoned, since it'll be mixed with the spinach, but be careful as the feta will add a lot of salt. Mix in the eggs. Add the spinach, by handfuls, stirring until the mixture is well combined. Proceed with the Basic Mina Template recipe. This Turkish-style mina with ground beef, lamb and crushed tomatoes is from Jennifer Abadi, author of A Fistful of Lentils (Harvard Common Press, 2002). Because it makes a large amount of savory filling, it's best to use a larger 9-inch square pan and 4 layers of matzo instead of 3. Simply soften two additional sheets, layer the matzo, then 1/3 of filling and repeat, topping with the final matzo layer. Abadi also recommends having additional prepared tomato sauce for serving leftovers if desired, as the sauce tends to absorb as the mina sits. Heat olive oil in a large skillet over medium-high heat for 1 minute, or until it is hot but not smoking. Add the chopped onions and cook until soft and somewhat transparent, 7 to 10 minutes. Add the ground beef, ground lamb, salt, black pepper and sugar and cook until brown, about 10 minutes (stir occasionally and mash with a fork to cook pieces). Lower to medium heat, add the chopped parsley and dill, and mix well. Cook 5 minutes. Pour in the crushed tomatoes and mix well. Bring to a slow boil over high heat and cook 3 minutes, then lower the heat to medium and cook an additional 7 to 10 minutes. Remove from heat and cool to room temperature. Mix in the beaten eggs and proceed with the Basic Mina Template recipe.